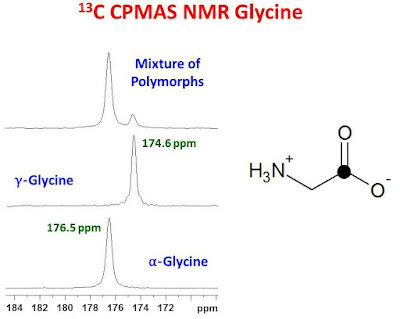 Glycine is an excellent setup compound for 13C CPMAS NMR measurements. Its utility in this regard has been described in detail.1,2 It can easily be observed in one scan and has reasonably short 1H T1's, allowing it to be used for 1H 90° pulse calibration and to setup the Hartmann Hahn matching condition. The width of the methylene carbon signal can be conveniently used to evaluate the proton decoupling efficiency. The width and shape of the carbonyl signal are very sensitive to the angle at which the sample is spun and can be used to set the magic angle with a reasonably high degree of precision. In addition the carbonyl resonance is sharp and can be used as a secondary standard for chemical shift calibration. If used as a secondary chemical shift standard, one must be aware that glycine has three polymorphic forms, each with different carbonyl chemical shifts. The polymorphic form is not generally displayed on the reagent bottle and different suppliers may provide different polymorphs or mixtures of polymorphs. It is therefore important to know which polymorph is being used to calibrate the chemical shift scale. The α and γ polymorphs are the most common and stable, while the β polymorph is less stable and easily converted over time to the α polymorph. Furthermore, the β polymorph has a very short 1H T1ρ at room temperature and therefore difficult to observe with typical millisecond CP contact times. The γ polymorph can be converted to the α polymorph at 165°C. The chemical shifts for the carbonyl resonances for the α and γ polymorphs are 176.5 ppm and 174.6 ppm, respectively.1 The chemical shift of the β polymorph is between that of the α and γ polymorphs however, it is not usually observed. 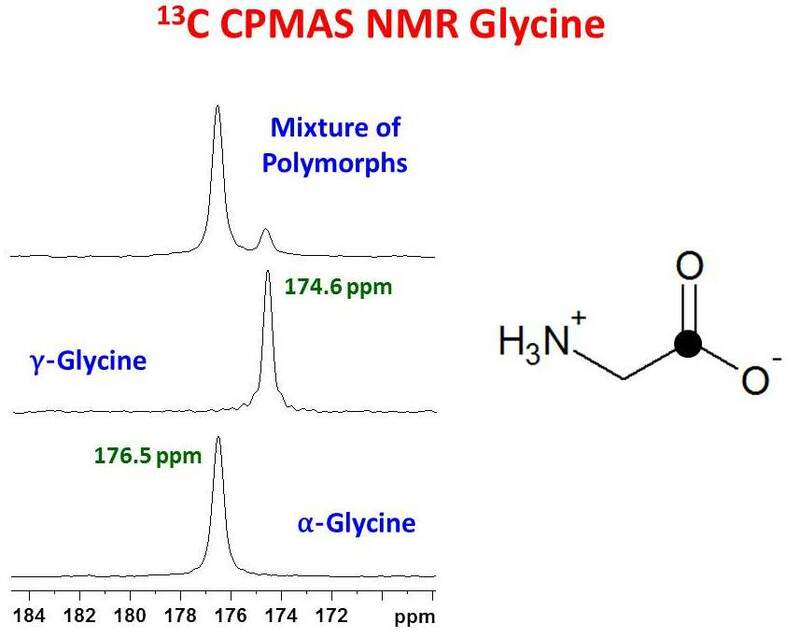 The figure below shows the carbonyl region of the 13C CPMAS spectrum of three samples of glycine: pure α, pure γ and a mixture of the α and γ polymorphs. If a single carbonyl resonance is observed for a sample of glycine using typical millisecond CP contact times, one can determine if it is the α or γ polymorph by measuring its chemical shift with respect to another chemical shift standard. Alternatively, since the 1H T1ρ characteristics for the α and γ polymorphs are quite different from one another at room temperature, the authors of reference 1 report that a CPMAS spectrum collected with a 20 msec contact time will show almost no signal for the carbonyl carbon of the γ polymorph. The carbonyl signal of the α polymorph, on the other hand, will be only slightly attenuated compared to a CPMAS spectrum measured with a 1 msec contact time. 1. M.J. Potrzebowski, P. Tekely, Y. Dusausoy. 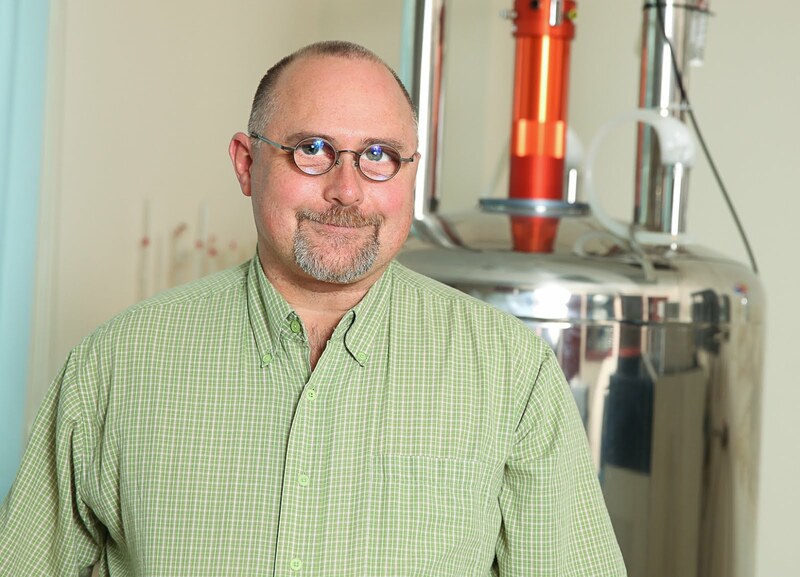 Solid State Nuclear Magnetic Resonance. 11, 253 (1998). 2. R. E. Taylor. Concepts in Magnetic Resonance. 22A, 1 (2004).